Cold, concrete, fluorescent-lit office spaces where employees are stacked on top of one another are a thing of the past. The new way to work is in a building that prioritizes the health and happiness of its workers. At least this is what award-winning design teams hope to create with a building they call Organic Grid+. Metropolis magazine and Business Interiors by Staples challenged young designers to reinvent the way we work with the Workplace of the Future 2.0 competition. Organic Grid+ designers Sean Cassidy and Joe Wilson beat out 153 other entries by wanting to prove that "workers are the heart of most businesses and should be treated as such." They created a space where desks and walls adapt to fit the needs of the individual. There would be a "health-conscious plug-in" where people can track their health (think along the lines of a Fitbit). This wearable technology would suggest meals and foods to help improve productivity, concentration, energy levels and morale. 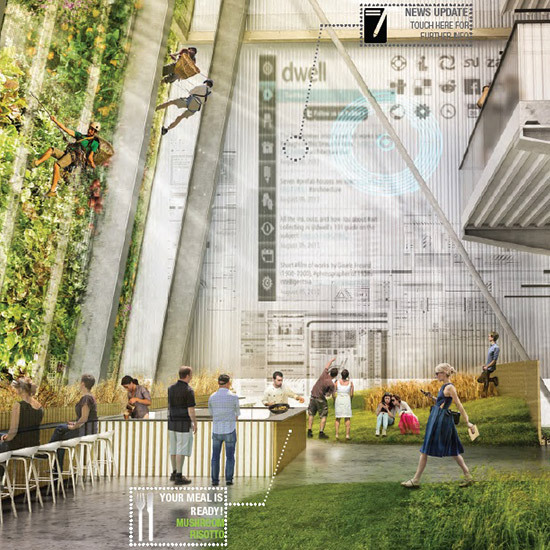 And to help with those meals Organic Grid's design would also feature Sky Gardens: individual indoor gardens where people can harvest food deskside. Having clean, healthy food untouched by chemicals and pesticides are all part of improving the work environment. The Sky Gardens would also provide natural cooling for the building, act as an acoustic buffer and help reduce carbon dioxide emissions. All of these features have been designed to seamlessly latch on to an existing building, making this something that could happen in the near future.